In the age of instant information transfer and social media, something as illogical and ludicrous as the War on Drugs cannot be sustained. Government prohibition of psychoactive substances triggers the unrealistic drive to “eradicate” their presence and just ends up being a war on people. Some of those in government are realizing this and, under public pressure, are decriminalizing aspects of the drug war, most notably seen in cannabis legalization sweeping across the U.S. More politicians and officials are speaking out to say we must change course. On Monday, former UN Secretary-General Kofi Annan penned an essay in Spiegel Online where he called for the legalization of drugs. He reiterated many long-known truisms, describing how prohibition brings a far worse danger to humanity than drugs themselves. He admits that the UN played a pivotal role in encouraging prohibition 50 years ago. The UN Convention on Narcotic Drugs in 1961 had the stated purpose to protect the “health and welfare of mankind,” but instead showed how centralized efforts to control behavior bring destruction and misery. 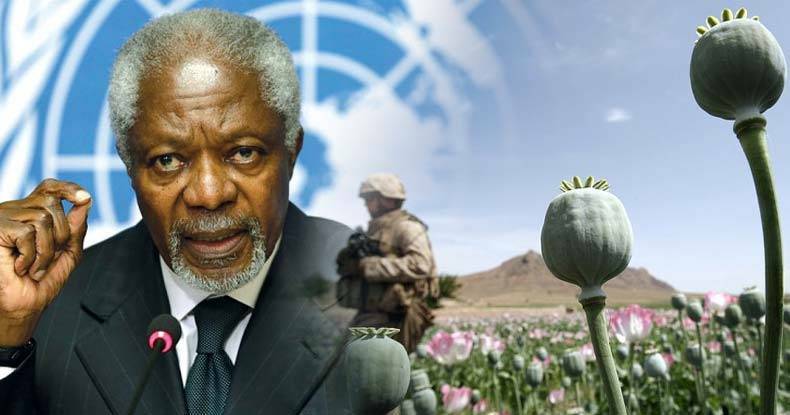 Prohibition has created a “vast, international criminal market in drugs that fuels violence, corruption and instability,” as Annan acknowledges, which amounts to a $330 billion per year industry. The drug war has no effect on the availability of drugs or the demand, yet $100 billion a year is spent on this consistent failure. Punishment of drug users and overcrowded prisons are just some of the ways in which this manifests. Wherever the criminal drug trade is concentrated, violence, and corruption ensue. In 2013 Mexico saw 16,000 murders, many directly linked to drug trafficking. Accepting that drugs are a reality and that some, like cannabis and psychedelics, have real and proven medical benefits, is necessary for governments to end their war on people. “First, we must decriminalize personal drug use. The use of drugs is harmful and reducing those harms is a task for the public health system, not the courts. This must be coupled with the strengthening of treatment services, especially in middle and low-income countries. Annan goes on to discuss regulation, public education, and taxation as the next steps, pointing to the decline in cigarette smoking in many countries. He mentions the always-tempting carrot of revenue collection through taxation of drugs, such as the $135 million collected by Colorado last year. Ideally, these things should not be necessary, but in one sense it provides a real benefit. Instead of buying from an unknown source through unknown middle-men, consumers can purchase from reputable vendors and know exactly what is in their product, as well as the risks. The story of cannabis shows that fears of wildly increased use after legalization are unfounded. Instead of exacerbating problems, legalization alleviates them. Let’s hope that Kofi Annan’s message resonates with those attending the UN special session on drugs April 19-21. The war on drugs is a failure, an affront to human rights, and a catalyst for violence. The war on people must end.